Sustainability Trust has newsletters and website available. They have events coming up in Wellington. Community Orchard Berhampore-Island Bay, Facebook page. Innermost Gardens, Mt Victoria. Includes classes, may be publicised on Chalkle. Operation Green Thumb - Wellington City Council sponsored community gardens Page includes a garden monthly action calendar for Wellington. For Wellington cafes with a preference for healthy and ethical food sources, see Conscious Consumers. Events and education on organics, from CommonSense Organics. Hill Street Farmers Market, open Saturday mornings. 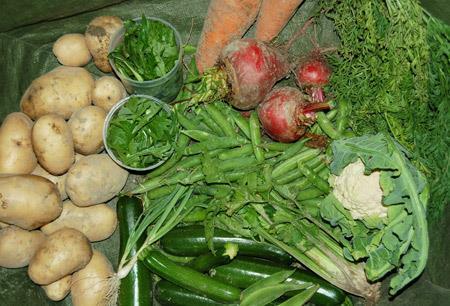 Wairarapa Eco Farms - community supported agricultural produce. Waste education workshops are run on varieous topics around Wellington region by Sustainability Trust. Re-use of items that others have no need for, but are not worn out, is great way to reduce landfill. See Second Treasures Shop. Surplus food is rescued by Kaibosh. Old phones, computers and other E-waste can be taken by Sustainability Trust, at low cost. Some printer toner or ink cartridges can be refilled by Cartridge World. Paint take back and recycling offered by Enviropaints at Otaki - download PDF brochure and by Dulux (Dulux PDF) and also paint take back at Wellington shops by Resene. In a quake-familiar Capital city, a reality of life is the need to be prepared for a 'big one' caused when the largest faults move. (video link: drop-cover-hold) One day courses in emergency skills are available in Wellington. Civil Defence experience from Christchurch and elsewhere in these Shaky Isles shows that NZ households can be prepared with a plan of action and key supplies for emergencies, when transport, cellphones and utilities may fail. Store some water, non perishable food, torch and batteries, radio, a well-maintained bicycle, etc. Grow food in your garden. Another important aspect of preparation is getting to know your neighbours, so that you are more able to help and be helped. Formal ways to do this include Neighbourhood Watch, but informal ones may be more fun - try gifting surplus veges or preserves, helping to water gardens or feed pets when people are away, holding a BBQ or street party on Neighbours Day (28,29 March 2015) For an infographic on good outcomes from Neighbours Day 2014 download this PDF. A great way to get to know your neighbours and others in this city is to join the Wellington Timebank. The timebank is a community of people who share their skills and knowledge with each other using time as the currency. Everyone's time is valued equally so one hour always equals one time credit no matter what skill you're trading. Warm up for Winter - funding may be available towards insulation of older homes. Providers in Wellington include RightHouse and Sustainability Trust. Wellington Curtain Bank, uses donated curtains and fits them for re-use warming your windows. Sustainability Trust “Smart Homes” program. Capacity manages Wellington Water supply. GWRC water pages and for educators, a GWRC water educational resource. Metlink Wellington Bus Network map. CityHop is a car share business. Public transport routes to hospital, for your care or visiting others. Cycle Aware Wellington (advocacy and info for cyclists). There's a map of cycling routes at Cycling Atlas. Frocks on bikes (women cycling everyday). Community bike repair workshop and therer are many commercial bike suppliers with workshop services available too. Living Streets Wellington - pedestrians advocacy, and can help you find some neighbourhood explore on foot maps. If you'd like to map your own local favourite walk on line for others to follow, using a smartphone with GPS, try this. Citizens Advice Bureau: Central Wellington or Eastern suburbs, or Johnsonville.